Organ donation can save the lives of people of all ages but there is limited information about organ donation among children. The C.S. Mott Children’s Hospital National Poll on Children’s Health asked parents of children 0-18 years about their attitudes and potential concerns regarding registering their children to be organ donors. Teens often receive information and can register to be organ donors when they get their driver’s license. Fewer than half (41%) of parents reported their teen 15-18 years had received information about being an organ donor, and 24% said their teen had registered. A majority of parents said their teen had not registered to be an organ donor (57%) or were unsure (19%). Of parents whose teens had not registered to be an organ donor, 49% would encourage their teen to do so, 22% would not encourage registration, and 29% were unsure. Parents of younger children seemed less comfortable with organ donation. Only 17% of parents of children 0-14 years said they would like to learn more about organ donation, while 52% would not want to learn more, and 27% were unsure. Parents’ preferred information sources about registering their children as an organ donor were their child’s primary care provider (64%), an organ donor organization (37%), a local hospital (24%), or a clergy member (7%). Parents of children 0-14 years expressed some concerns about registering their child as an organ donor. About half of parents reported major concerns about whether their child would get all treatment options in a life-threatening situation (54%), and that keeping their child alive for organ donation might make their child suffer more (53%). Other major concerns were not knowing if they could decide which of their child’s organs would be used for transplant (33%) and the potential cost of organ donation (30%). Few parents were concerned that their religion does not support organ donation (7%), while 6% of parents said their only major concern was that they just didn’t want to think about organ donation. Parents of children 0-14 years also recognized major benefits of having their child registered as an organ donor, including having their preferences known in advance (51%), having an opportunity for their child to help other children (70%), and increasing the number of child-sized organs for transplant (67%). One in 4 parents of teens of driving age say their teen is registered to be an organ donor. Only 17% of parents of younger children said they would like to learn more about organ donation. Over 2000 US children are on an organ transplant waiting list. Recent advances in medicine allow for life-saving transplants of kidneys, livers, hearts, lungs and other organs to cure previously fatal conditions. However, children often wait longer than adults for available organs, as in many cases, transplanted organs must come from another child of a similar age or size. Typically, teens have their first opportunity to register as an organ donor when they get their driver’s license. In addition, some states have required organ donation education in schools. Results of this Mott Poll confirm that many teens have already registered as organ donors, and that there is considerable parental support for registration among teens not currently registered. However, less than half of parents reported that their teen has received information about organ donation, which suggests that more needs to be done to inform teens and their parents about this option. In contrast, there is no common time or mechanism for parents to consider registering their child to be an organ donor. The issue of organ donation is not addressed in most schools or in a routine manner by primary care providers, many of whom may be unaware of the specifics of the issue and unable to answer parent questions. Because there is no common structure, parents may have their first introduction to the topic of organ donation by children at potentially the most difficult moments of their lives, when their child has experienced a tragic event and is a candidate organ donor. Additionally, not all hospitals may have personnel trained to have this type of discussion with grieving parents. 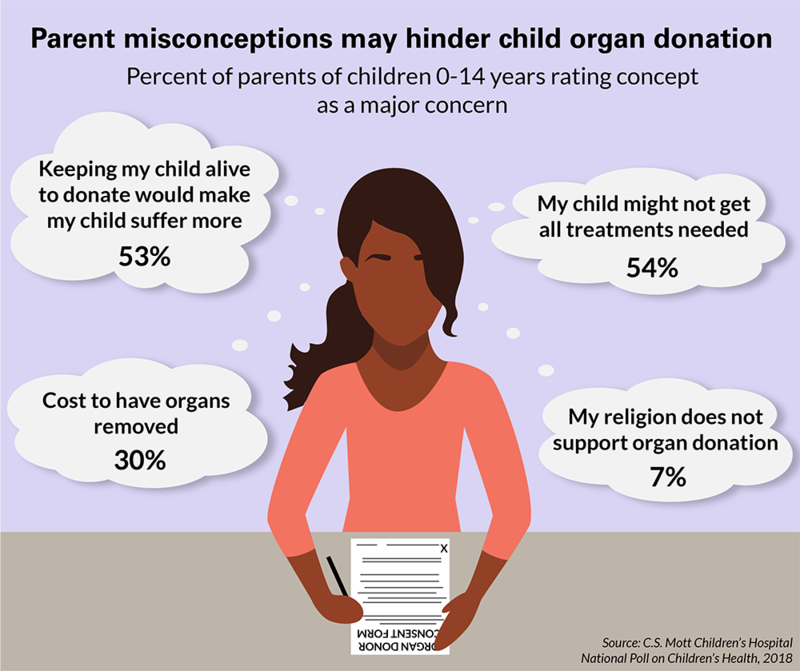 In this Mott Poll, fewer than one-third of parents of younger children would consider registering them as donors, and many parents expressed concerns about organ donation that may be based on inaccurate perceptions. One area of concern is that the child registered as an organ donor would not receive all available treatments. It is important for parents to know that registering their child as an organ donor will not negatively affect in any way the medical and nursing care their child will receive. All appropriate efforts to save the life of their child will be conducted whether or not their child is a donor. In fact, potential organ donors must receive exceptional care because if the heart stops beating some organs cannot be transplanted. Another key area of parental concern is that keeping their child alive for organ donation might make their child suffer more. The idea that their child might feel pain from donating organs can be very uncomfortable for parents. However, organs are not removed until a child is declared dead and there would be no potential for the child to experience any pain. It is also important for parents to know that there is never a cost to the donor’s family for organ donation. Although it can be difficult for parents to even think about the tragedy that might result in their child becoming an organ donor, the majority of parents in this Mott Poll realized that a major benefit would be the opportunity for their child to help save the lives of other children. This may be a reason for our nation to consider an organized mechanism for parents to gain information regarding organ donation and to expand the structure for donor registration to younger ages. Until a broader system is in place, parents with questions about organ donation can contact their state’s organ donor registry. This report presents findings from a nationally representative household survey conducted exclusively by GfK Custom Research, LLC (GfK), for C.S. Mott Children’s Hospital. The survey was administered in November 2017 to a randomly selected, stratified group of parents age 18 and older (n=2,005). Adults were selected from GfK’s web-enabled KnowledgePanel® that closely resembles the U.S. population. The sample was subsequently weighted to reflect population figures from the Census Bureau. The survey completion rate was 60% among panel members contacted to participate. The margin of error is ±1 to 5 percentage points. Freed GL, Singer DC, Schultz SL, Gebremariam A, Clark SJ. Parent views on registering children to be organ donors. C.S. Mott Children's Hospital National Poll on Children's Health, University of Michigan. Vol 31, Issue 1, January 2018. Available at: http://mottpoll.org/reports/parent-views-registering-children-be-organ-donors.